Hosting the National Eisteddfod brought mixed results, according to traders in the Flintshire town of Mold. While some cafes and hotels enjoyed good business, others said the festival caused a drop in trade. Figures show 154,944 people attended the festival, which was last held in the Flintshire town in 1991. Town centre manager Keith Williams said while some expected "great things", nobody was "despondent," and some said trade picked up to the end of the week. He added: "It certainly didn't bring megabucks, but overall there were no losses." Mr Williams said he had conducted a "straw poll" of several businesses in the town, adding: "Most of the people I spoke to said trade wasn't exceptional. "Some had been expecting great things that never materialised. "Listening to some of the complaints about noise, it would suggest evening trade was very good." Newsagent Karen Jones said business was "diabolical" at her Early Bird shop. She added: "It was a really disappointing week. The afternoons have been particularly dead. Other traders have also been complaining." One local cafe owner said they had experienced similar problems during the 1991 event, adding: "People paid £11 to go on the eisteddfod field. "There's food, drink, and entertainment there - why would you leave the field?" However, Jill Bryan, who runs the Truly Scrumptious cafe with her sister-in-law Julie Bryan, said trade had been "fantastic". She said staff had taken lessons in order to be able to converse with customers in Welsh, and they had extended their opening hours to accommodate people leaving the field. She added: "Everybody really enjoyed it, and we got into the spirit of things. It was really busy. "Some traders have been over-optimistic." 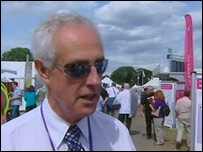 Speaking earlier, festival organiser Hywel Wyn Edwards described the Eisteddfod as "a phenomenal success", and said he hoped the show would leave its mark on the area.